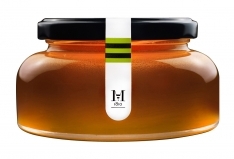 This case of four honeys includes a jar of rosemary honey, a jar of orange honey, a jar of high mountain honey and a jar of forest honey. 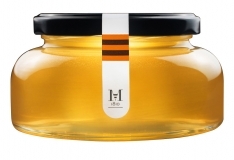 The rosemary honey has a clear, floral aroma and sweet flavor with subtle acid tomes, and is particularly well suited to salad, fruit and cod and lamb dishes. 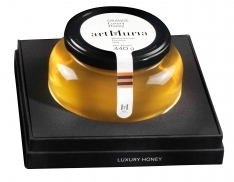 The orange honey is warm and light with amber tones, and its citrus scent lingers on the palate. 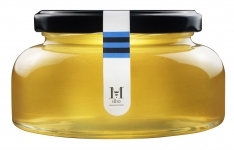 Sweet and juicy, it fits in perfectly with duck, fresh cheeses, ice cream and baked goods. 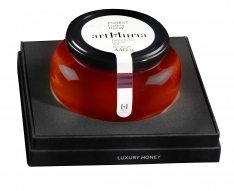 High mountain honey is amber with reddish notes and has herbaceous aromas arising from its meadowland origins. It's a great choice for pasta,mushrooms and mountain cheeses. Finally, the forest honey is darker, with an intense toasted cereal aroma, and a sweet flavor underpinned with salt tones. 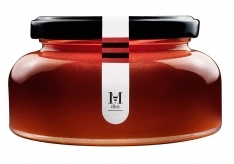 It's a great com anion for fried vegetables, tempura, spicy roasts, strong cheeses or bread with a little olive oil. In Spanish, this product is called, "Estuche 4 mieles variadas Artmuria."